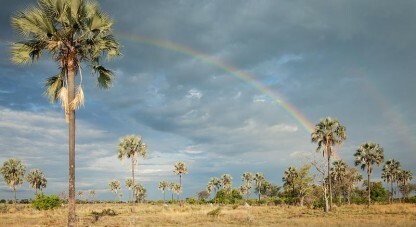 When photographing on any kind of safari, I am never without a wide-angle lens in my camera bag. Despite the fact that I typically take more images using my mid-range and telephoto lenses, I am always looking for opportunities to make use of wide-angle lenses. By very broad definition, a wide-angle lens for the purpose of this post would be any lens that has a focal length of between 14mm and about 70mm. Such focal lengths lend themselves to compositions that incorporate much of the surroundings in the frame. This can be a very rewarding style of nature photography. One of the times when I reach for the wide-angle lens, is when there is something out of the ordinary happening in the sky above. In the image above, the twin rainbow stayed bright for long enough that I was able to compose this frame using the palm trees as an added element of interest in the frame. As the sky and the rainbow were the main points of interest in the frame, I made sure to compose accordingly, giving the bulk of the frame over to the sky. I shot the image at 28mm on a full-frame sensor camera. Sometimes, it happens that you are able to include wildlife in your wide-angle frame. 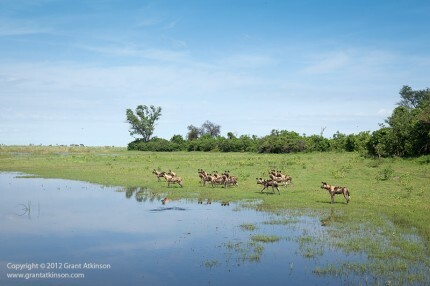 Shooting with shorter focal lengths means that smaller animals can become tiny and insignificant in your final image, but in this case a group of wild dogs gathered together meant that the group covered a larger part of the frame. It would have been difficult to photograph just a single wild dog in the same location. Luckily, the sky had enough soft cloud in it to add interest, and I was able to compose the shot at a focal length of 55mm, including sky, clouds, reflections and wild dogs in the frame. A dead leadwood tree illuminated up by the sun, with an approaching storm in the background. Canon 5dmk2 and Tokina 16-28 lens. Shutter speed 1/800s at f/9.0. Plus 0.67 exp comp. Iso 400. 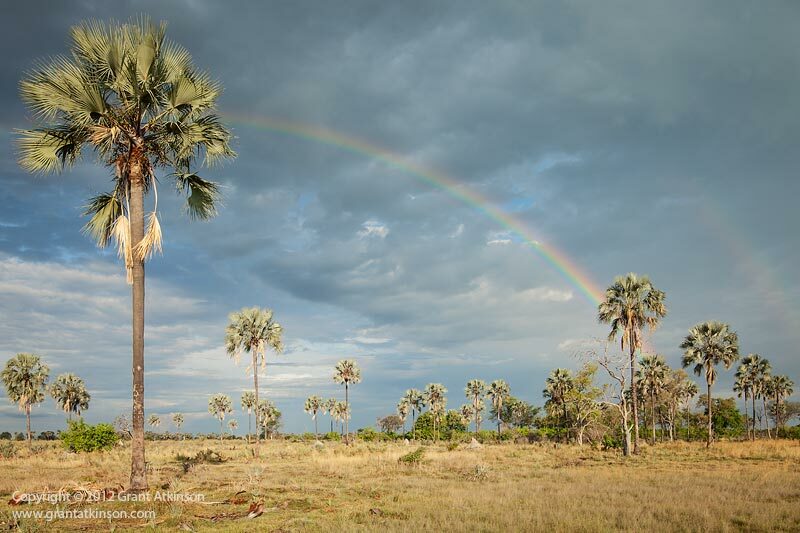 I also really enjoy using wide-angle lenses to try and capture some of the drama that the rainy season and its attendant thunderstorms can bring. 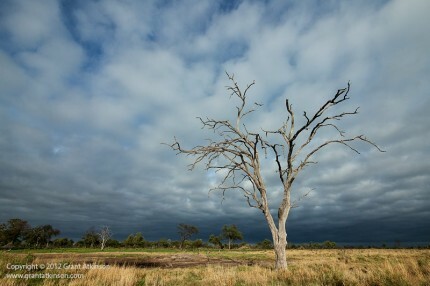 The above image of the dead leadwood tree was captured in the Okavango Delta, Botswana in the early part of the rainy season. An approaching thunderstorm had given the sky just above the horizon a dramatic, dark look to it. Fortunately, the sun was still shining on the dead tree in the foreground. Such skies add depth to an image, as well as atmosphere. It is important to take advantage of such conditions as soon as you see them though, as they can be fleeting. In this instance, just moments after I took this frame, the rolling clouds passed between us and the sun, and the gold light illuminating the foreground disappeared. For this image I stood really close to the tree, and shot at a focal length of 16mm using the Tokina AT-X 16-28 f/2.8 lens. I find that I get my best results using wide-angles in these type of environments when the sky has added interest in it, whether that be clouds with patterns, rainbows or storm clouds. I don’t usually find that plain blue skies, nor uniformly dull, overcast skies, are as pleasing. Grant, great blog. I have not used my 16-35L lens much, but will bring it with me on trips in the future. I haven’t learned to recognize the opportunity for wide angles, so this blog is very helpful. Love the wild dog photo and congrats for having it selected on Africa Geographic. Hi Dave, thanks for your message…glad to read that you found the post useful. I envy you your Free State skies, and the summer thunderstorm build-ups that take place there. I have often wished I had more time to spend in the Free State and the Highveld just for photography, some of the scenes I have driven by when travelling through have been phenomenal..
Great post Grant, and I couldn’t agree more. In fact, after using my 100 – 400 on safari, with 95% of the shots at 400 because 100 is generally not quite short enough for any ‘animals in context’ type images, I got a second hand 35 – 350 mm L series lens, which I now use 90% of the time while on safaris. On a full frame this gives me a nice range of focal lengths so I can get close-ups and context shots at the same sighting. That is a very useful lens choice, and it is an important point that you remind me of with your comments. I have often missed out on capturing some of the better wide-angle scenes that present themselves when I am out and about, just because I did not want to take the time to change lenses. Having a one-lens solution kind of lens like you mention makes it easy to take advantage of the scenery with a minimum of fuss…and you are also never caught out when things suddenly start to happen unexpectedly by having the wrong lens on the camera.